Hello Beautiful People (if you are reading my blog, you must be)! Back in September, when I came back from my holiday, my skin was really messed up by all the sun, salty water, messy skincare routine and hot and humid weather. Basically my skin needed rehab. What a better time to try a new serum? 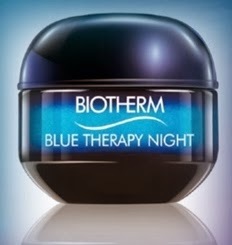 I had the pleasure to receive the new Biotherm Blue Therapy. I have used this brand before, I remember a serum and a cream that were a dream come true for my skin when I was very stressed and break outs prone, shame they don't do those anymore. The product comes in a glass bottle (love!!!) with a pump. The first thing about this new launch that caught my attention was the "serum in oil" description. As soon as I tried, it came pretty clear why there is such a description. The formulation looks like a gel but when applied it melts into my skin with a consistency more similar to an oil, without the unpleasant feeling of greasy and oily residues. It's very easy to apply all over, it doesn't absorb as soon as touches the skin (Estee Lauder Idealist, I am talking to you) and I need about two pea sized drops for all my face. The most important ingredients are the Ulkenia, extracted from micro algae and used in skincare for the first time, ceramides and vegetal oils complex rich in anti-oxidants and you will be happy to know that is completely paraben free. What does it promise? A fast and deep repair effect, reduction of wrinkles, protected and more luminous skin. What it really did for me? Everything that it promised. After using this for two months, I am totally satisfied with the results. The most noticeable result is on the tone and the texture of my skin: It's smoother, softer and more even. Pores are smaller and the dry areas I usually suffer with are much better. It didn't cause any break outs and when I applied over some spots it helped to calm the irritations and to avoid dry patches. I have used it as advised, at night time only, on clean skin, underneath my moisturiser, applying it from the centre of my face towards the outer parts. Priced £44, I can totally recommend this serum if you want to treat your skin to something better than the usual serum. You can find Biotherm in Boots, where the Sale Assistants are always very happy to help you find the most suitable product for your skin. There is a new Biotherm moisturiser that came out soon after this serum, it may be my next purchase because at this point i am very curious to try more from this brand! Hi Laura, I would suggest you to give this ona a go, it's so lighweight aswell, doesn't cloggs pores, I love it! Overall take-up in the Bangkok office market was 6,859,726 m2, up 0.4% Q-o-Q and 1.4% Y-o-Y. The total occupancy rate also improved slightly from 85.6% to 86% in this quarter. The vacancy rate was 14.0%, a fall from the 14.4% recorded in Q1 2010. In Q2 2010, overall rents fell for the sixth consecutive quarter since the beginning of 2009. Grade A offices in the CBD area faced a 0.4% Q-o-Q and a 2.9% Y-o-Y CBD for pain in rents, down to THB 680/m2 in this quarter from THB 683/m2 in Q1 2010.